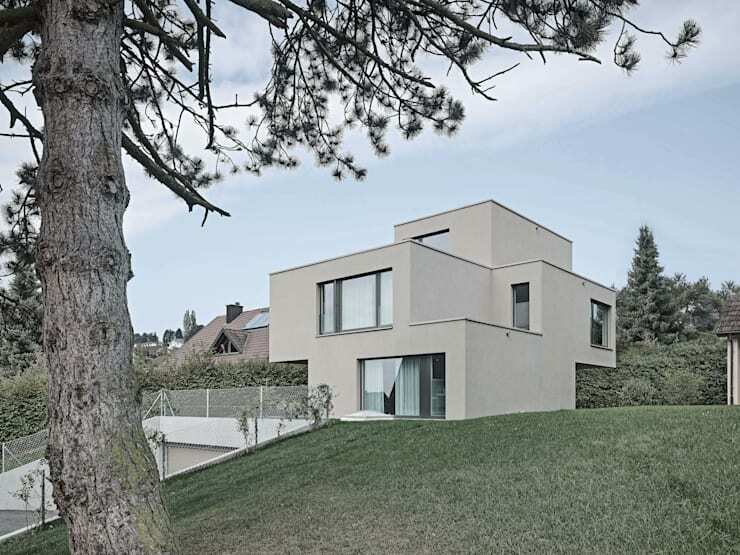 The Swiss home we will explore today is composed of four distinct building masses. They have been shifted and arranged to create a cubist-style grey exterior. The unusual levels formed by this facade create interesting opportunities for arranging the interior. So we are particularly curious to see what's in store for us today! The basic form is composed of two offset rectangles. The shifted levels of these rectangles generate a sculptural volumetry and give the house an extraordinary presence. 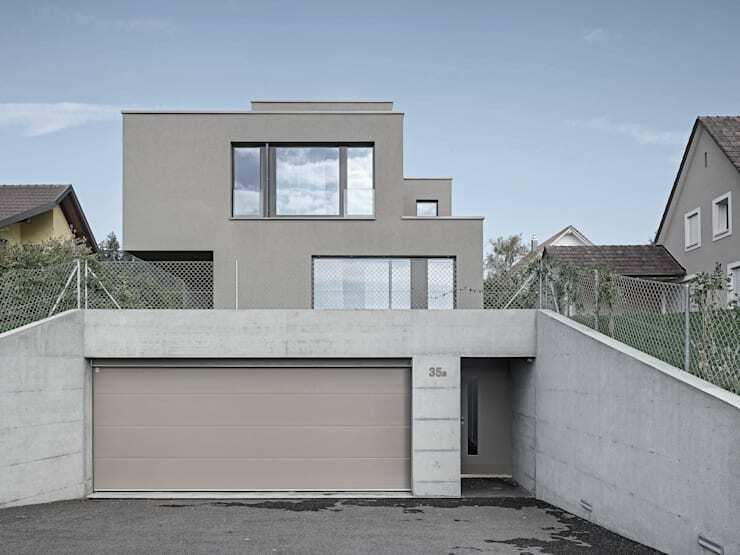 The home is perched atop a gentle hill and the higher windows frame breathtaking views of the Swiss Alps. The home is surrounded by semi-detached abodes, so it's wonderful to see how the various planes of the home have been utilised to minimise loss of privacy and maximise the views. The site slopes down to meet a side street and has a very narrow and elongated shape. This was the inspiration for the architects to create a very unusual entrance. Both the garage and entrance are set on this lower ground floor. Note the entrance on our right here. It runs parallel to the garage and leads visitors up from the lower ground floor, through a sky-lit entrance and into the sunny ground floor. The gentle shifts of the larger building masses are expressed as corresponding shifts within the interior. Here we can see the shifting floor level has been turned into a transition point in the form of two steps. 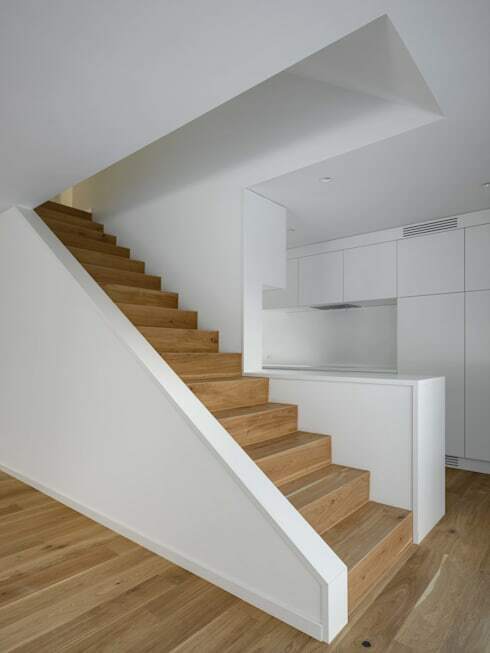 These steps separate the living area from the dining area and kitchen. The bright living room also has carefully positioned and generously sized windows that bring the surrounding garden indoors. The main living area has an open-plan layout, and this level has been arranged to revolve around the fireplace. 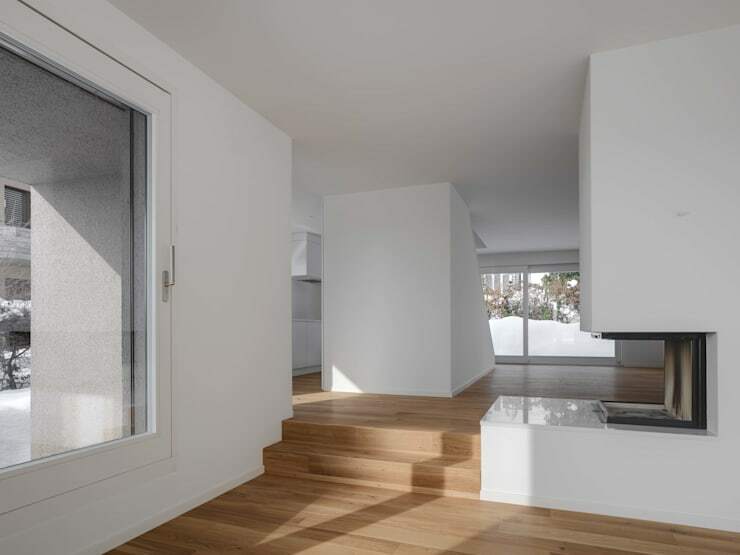 A central fireplace is a key feature in many Swiss homes and this one is visible from all sides. In a sense, it forms the centrepiece of the home. The interior has a wooden floor and an all-white interior. This allows the unusual shapes and negative spaces in this home to really shine. The home has a very simple, sparse ambience, but there is no shortage of attention to detail. 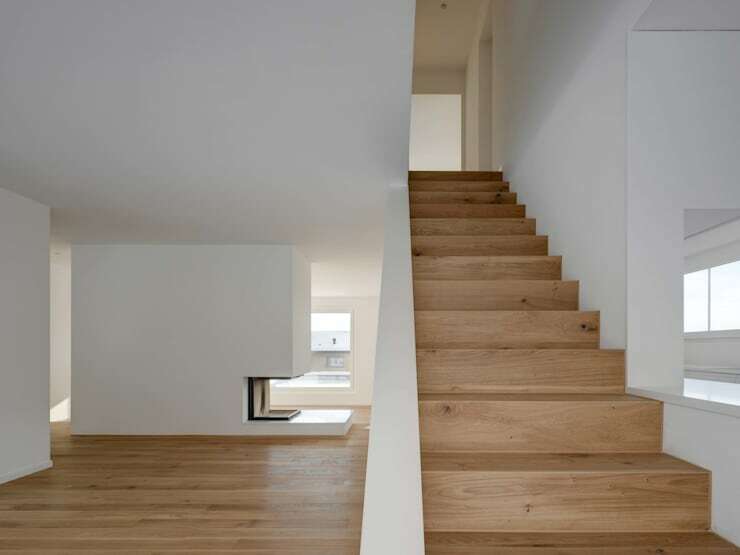 The wooden staircase is solid, made from beautiful timber and imbues the quiet home with a natural warmth. This is particularly important in a minimalist home set in wintry landscape. After all, every home should have warmth! 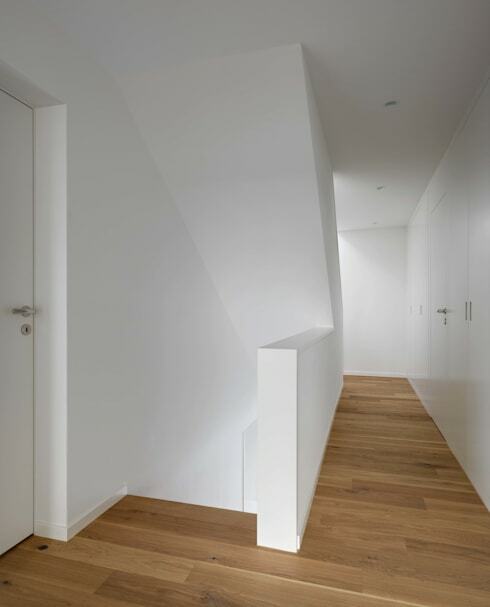 In this simple white hallway we get a sense of the very private nature of this home. The bedrooms have been arranged around the staircase and each has its own private outlook. The bedroom windows have been precisely set and arranged to create perfect views of the famous Swiss Alps. The building masses allow for lots of unusual window placements. Here in the bathroom a large floor-to-ceiling window provides unimpeded views of the surrounding landscape. This creates a bathroom that is both abundant in both light and privacy. 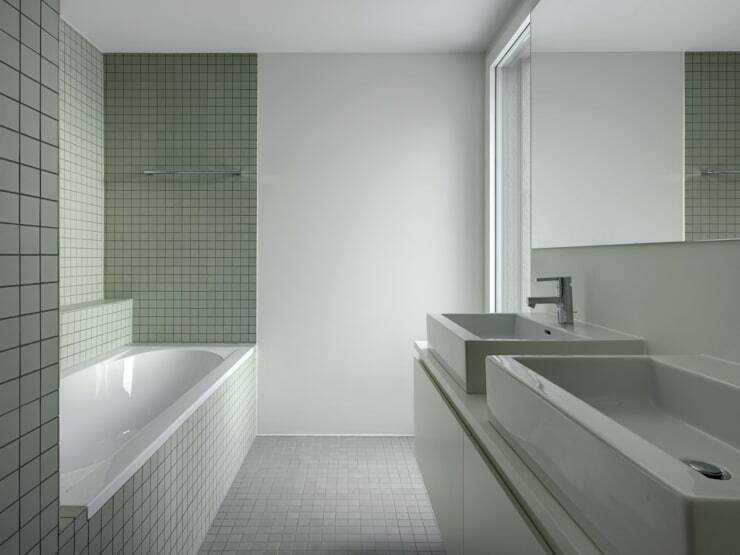 The green tile has a subtle sophistication that is perfect for this rather cool home. If you are interested in exploring this style of home a little further, have a look at The tiered home with a touch of magic. It's a real beauty! What do you think of the central fireplace in this Swiss home? Let us know in the comments field below!